Everyone’s an expert. Just listen to any of the phone-ins on local radio or maybe Jeremy Vine’s show on Radio Two, especially following some big news item, and you’ll hear incredible levels of knowledge about almost everything. Last week’s budget was a good example where it was a surprise to find there were so many experts opining on the running of big businesses which, of course, were underpaying their employees and stashing big profits away from the taxman. 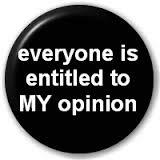 Everyone’s entitled to their opinion (as proof, I own a t-shirt a friend had specifically made for me with the slogan “everyone’s entitled to my opinion” splashed across the front) but surely, on the bigger issues, where extended knowledge is key, opinions should be expressed as questions . . . shouldn’t they? Polarised opinions formulated as facts do get a touch wearing; statements that affect many but say little. Life’s never that simple. Take summer in Durham City. If I could have a pound for every time I’ve been told that because Durham’s a tourism magnet, it will mean that our restaurant’s at its busiest during the summer months – I wouldn’t have to worry about the level of business in the summer months. The University of Durham dominates the City. Students do make up a significant part of our customer base but they aren’t a majority. We’ve a pretty wide customer base with people from all walks of life and of all ages. They tend to be people who appreciate our values of local sourcing, knowing where our food comes from and our traditional British style of cooking. But that’s a level of knowledge we build up over a period of time and, for that reason, is a message that isn’t immediately obvious to tourists. And tourists are important to us because students go away during the holidays. Now, even though students don’t make up a majority of our customers, there’s a massive infrastructure that supports those students that’s got a wider influence than is at first apparent. Think about it: in 2014 there were approximately 17,500 students at Durham University. 17,500! That’s a reasonably-sized town on its own, never mind as an addition to a city with a population less than 50,000. But, to support that many students, you need a fair few participants. There are, of course, the academics. A 30 second trawl of Google didn’t get me their number but it’ll be a sizeable one. And all those students and academics need administrative support whose number will, as it’s a public sector body with a high opinion of itself, be enormous. I’m wondering if we’re beginning to double that 17,500 hundred number yet. Well, if not, there are all the maintenance people, whether directly employed or contracted-in. After all, there’ll be bed springs to replace and beer dispensers to mend along with the replacement of light bulbs and the cutting of grass around the University’s 63 listed buildings, which themselves will require a little maintenance attention. And there are all the suppliers to the university who provide them with vegetables and wood polish and paper hand towels and beer and clean laundry and so on. These are complemented by all of the external accommodation suppliers who have to collect the students’ rent, maintain their buildings and receive their own supplies to do the same. All of these thousands of people will obviously tend to think of taking their holidays when the students are on holiday and things are a little quieter. And many of those associated with the University are married or partnered to others in and around Durham itself who’ll also think of taking their holidays at the same time, which makes things a little quieter still. So, because a large proportion of of those associated with a large institution that’s home to a large body of students decide to all go on a large proportion of their jollies at the same time, Durham becomes a rather quiet place during the summer months. It’s not the lack of students; it’s everybody else. So, despite what the so called experts think, visitors to the city during the summer aren’t exactly a route to retirement. But despite that, thanks goodness for tourists. We couldn’t live without them. Reblogged this on Bill Oldfield.